The Toj Mahal Hotel was built in the center of Fergana. On the ground floor of a three-storey hotel "Toj Mahal" there is a shopping center. 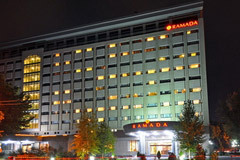 Second and third floors of the hotel feature 23 rooms: standard single and double, Suites and Deluxes classes. In front of the hotel there are the bank and "Traktir" cafe. The central bazaar is located in five minutes from the hotel. Toj Mahal Hotel features a cafe, restaurant, bar and nightclub. 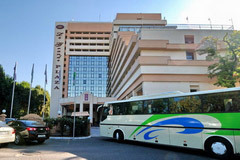 Amenities of the hotel also include a large banquet and conference halls, beauty salon and souvenir shop for tourists. Moreover, the Toj Mahal Hotel has a covered garage parking.